Road to Qualification: Went out at the pool stages in 2011, but finished 3rd, which is enough for teams to qualify for the next RWC. The brothers play their club rugby at Northampton Saints, and George his known for his explosive runs and big hits, as Shane Geraghty found out all to well. The Chiefs winger recently changed his allegiance to Samoa, becoming eligible after playing for the Samoan 7s side and will be a great asset for them. The versatile back, who can also play full-back and centre, is well known in Super Rugby for his defense splitting runs and sidesteps. Props: Viliamu Afatia (Agen), Jake Grey (Samoa Scopa), Census Johnston (Toulouse), Anthony Perenise (Bristol), Sakaria Taulafo (Stade Français). Hookers: Wayne Ole Avei (Bordeaux Begles), Manu Leiataua (Aurillac), Motu Matu’u (Hurricanes). Second Row: Faatiga Lemalu (Bourgoin), Filo Paulo (Benetton Treviso), Kane Thompson (Newcastle Falcons), Joe Tekori (Toulouse). Back Row: Maurie Faasavalu (Oyonnax), Alafoti Faosiliva (Bath), TJ Ioane (Sale Sharks), Jack Lam (Bristol), Vavae Tuilagi (Carcassonne), Ofisa Treviranus (London Irish) (Captain). Scrum Halfs: Vavao Afemai (Samoa Vaiala), Kahn Fotualii (Northampton Saints). Fly Halfs: Patrick Faapale (Samoa Vaiala), Tusiata Pisi (Suntory Sungoliath), Mike Stanley (unattached). Centers: Rey Lee Lo (Cardiff Blues), Johnny Leota (Sale Sharks), George Pisi (Northampton Saints), Paul Perez (Natal Sharks). Back 3: Faatoina Autagavaia (Nevers), Ken Pisi (Northampton Saints), Tim Nanai Williams (Ricoh Black Rams), Alesana Tuilagi (Newcastle Falcons) (Vice Captain). Some questionable selection choices such as leaving out experienced players such Paul Williams and the recent retirement Daniel Leo have put Samoa in a difficult spot just before a World Cup. But, this Samoan team will be still be looking to at least reach the quarter-finals. Their last pool game at Scotland looks like a winner-takes-all clash. 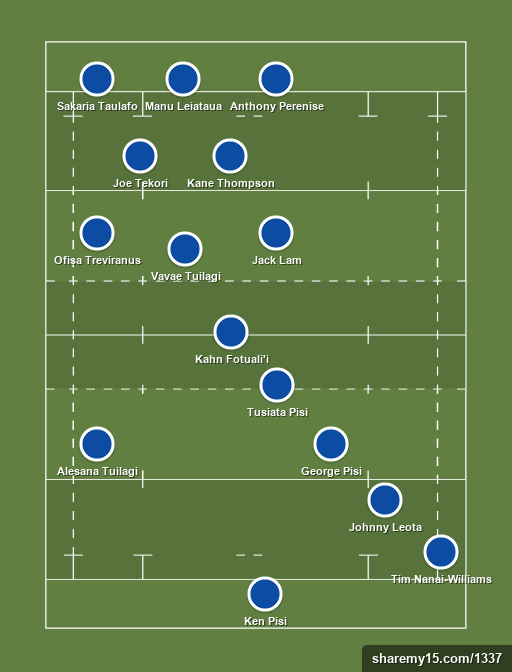 Renowned for being a strong, physical team they will look to smash their way through opponents, with a bit of individual flair from some of the backline such as the Pisi Brothers and Nanai-Williams. A lack of depth in scrum half and fly half positions may prove costly, with Head Coach Stephen Betham deciding to only bring along 2 scrum halves and 3 halves. They will be relying heavily on Fotualii and Pisi to remain fit throughout the tournament.